Hello and Happy Tuesday! Well since it's Tuesday, I'm back over at Stamp, Ink, Paper with my another card. 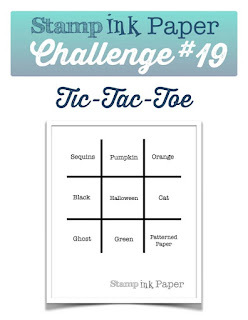 This week we have a Tic-Tac-Toe Challenge! For my card, I decided to go with the middle row accross: Black, Halloween, and Cat. Here's what I came up with this week.. 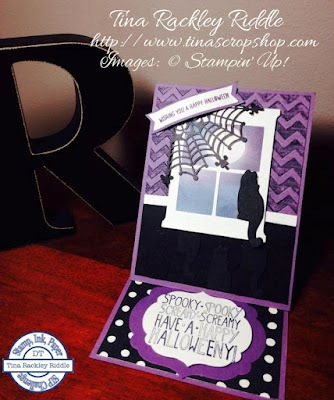 I made a Halloween Easel Card in Perfect Plum, Basic Black, and Very Vanilla. I just love the new window from the Hearth and Home Framelits and the Cat from the Festive Fireside Framelits Dies is just so cute that I couldn't wait to use him (or her). I even did a little faux embossing on the bottom of the black wall by cutting out a few more of the black cats and adhering them to the Basic Black Cardstock. The upper part of the wall was Perfect Plum cardstock that was embossed using the Chevron embossing folder. I rubbed the raised section of the embossing folder with Memento Tuxedo Black Ink before embossing it to give it a distressed look. The window scene was sponged using Soft Sky, Tempting Turquoise, and Perfect Plum on Very Vanilla Cardstock. I used a post-it note punched with a 1" circle punch as a mask for my moon. I wanted to give it a hazy look and I think the combination of blue and plum really did that. I used a 1/4 section of one of the Spider Web Doilies on the upper left portion of the window. My sentiment from the Happy Scenes Stamp Set was stamped in Perfect Plum on Very Vanilla and then backed with Perfect Plum Cardstock. I cut banner ends with my Banner Punch. The bottom of the easel card is Very Vanilla with a 3" strip of Happy Haunting DSP in Black and Very Vanilla polka dots on the bottom of the section. The sentiment on the bottom is from the retired Mingle all the Way Stamp Set and was stamped in Memento Tuxedo Black on Very Vanilla. I die cut the sentiment and used Dimensionals to pop it up on the Perfect Plum larger Die Cut. This made a prop to hold my card up. I really love the way it came out! Thanks so much for stopping by! I hope you'll head over to SIP and link up a card of your own. Great easel card, Tina! Love all the purple elements, and the kitty in the window is the cutest!